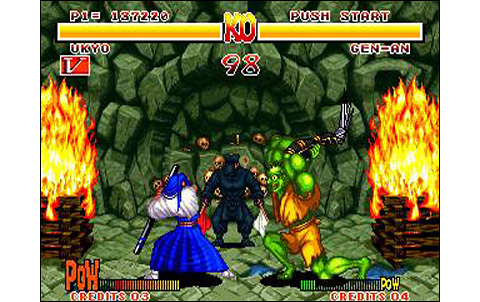 Having clearly made versus fighting games its hobbyhorse during the last two years (1991-1992), the SNK company has been working hard to compete with its rival Capcom on this field. 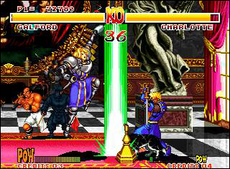 And the goal is heavily rewarding especially in the arcades with the MVS system, but at a smaller scale on home consoles with the Neo Geo AES: given the number of Street Fighter II cartridges that were sold over the world on the Super Nintendo, SNK also probably wants to exploit the gold mine. Battle was on earlier this year,with the last vestiges of Fatal Fury and Art of Fighting that made great sensation, facing Street Fighter in the arcades. 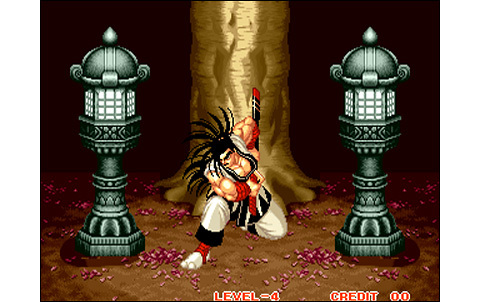 But in 1993, the editor hits even stronger with Samurai Shodown, aka Samurai Spirits: the company releases here a brand new game showing exceptional quality, including a totally new gameplay. 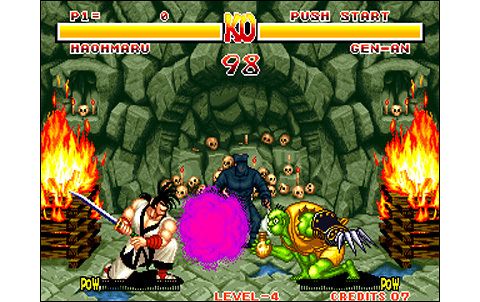 This newcomer, when it reaches the arcade rooms, almost relegates Street Fighter II to the museum, strong with its complex mechanics and gorgeous realization. Introducing for the first time weapons in a versus fighting game, the new baby of SNK makes a real splash in the arcades as we'll see in the following lines. 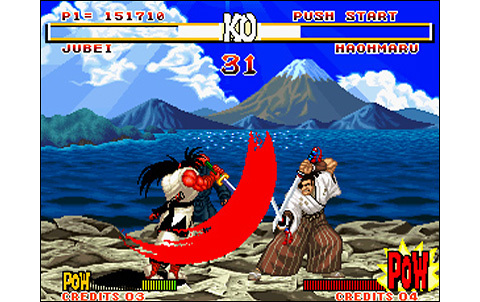 Huge commercial success back in 1993, Samurai Spirits largely deserved this plebiscite: the game is a blow in every way. 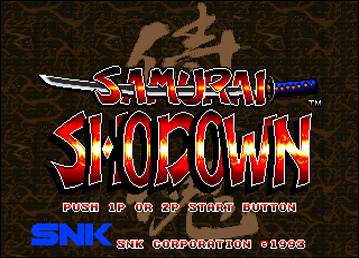 I'll start by talking about the realization, worthy of the most remarkable SNK titles. 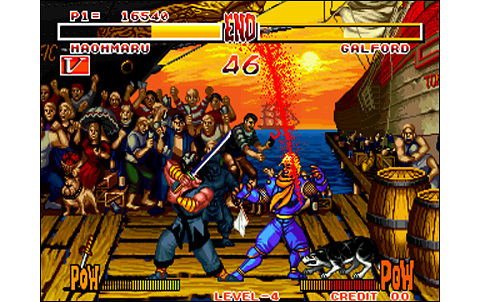 The graphics are setting perfectly the atmosphere of the Samuraï times in the feudal Japan... anyway, we'll have to travel the world in each of the countries of the twelve warriors of the game: France, United States, China, Japan, South America... 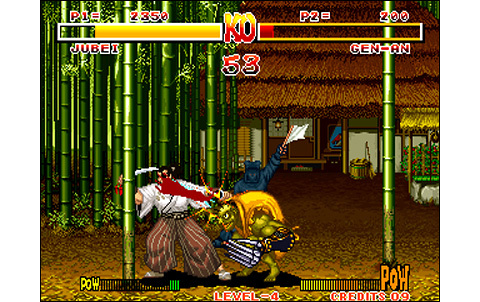 The stages are really wonderful and the style is brand new, as well as the characters of the game. 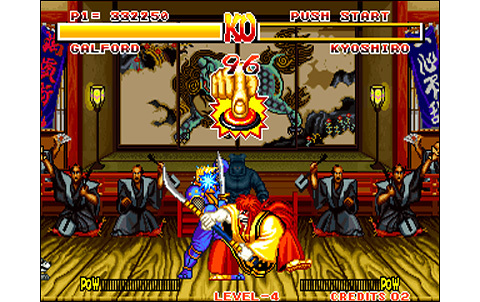 Each fighter have its own style, all different enough to make them very personal and interesting to play. 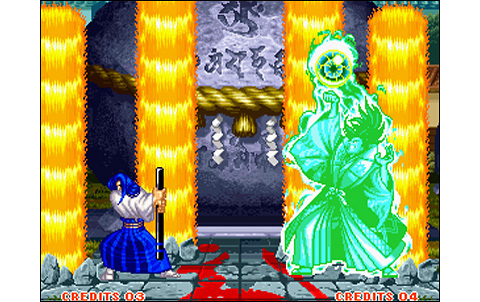 From Tam-Tam the spectacular to the sublime Ukyo, but also the infamous Gen-An and the mysterious Hanzo ... The knives are in the spotlight: sabers, foils, sickles, nanto, etc... 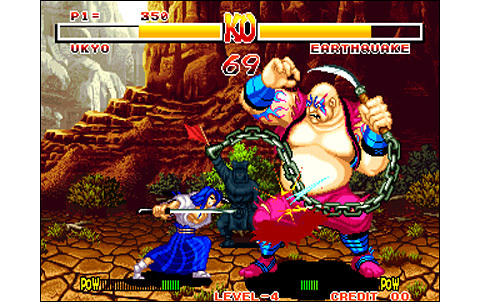 Some warriors even use animals, trained to fight, to kill their opponents. 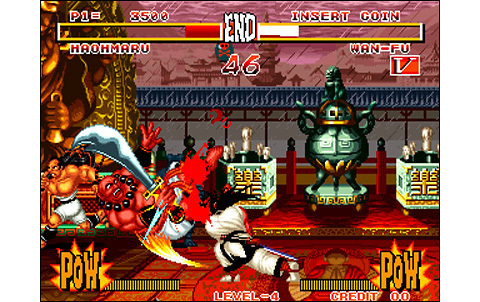 And for hemoglobine lovers and gore aficionados, here's the icing on the cake: fights can end dramatically, by cutting the enemy in half or slashing a vital point edge, resulting in an tragic bloody agony... Gorgeous, isn't it? 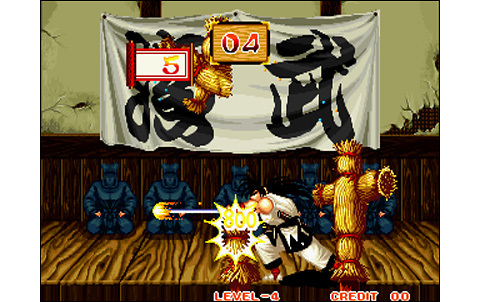 Another pleasant details: some elements in the backgrounds can be broken, and more funny, you'll see a guy named Hikyaku run from left to right and right to left just behind our warriors: this one sends food, bonuses or bombs during the events, just to put a little more spice in the fight! 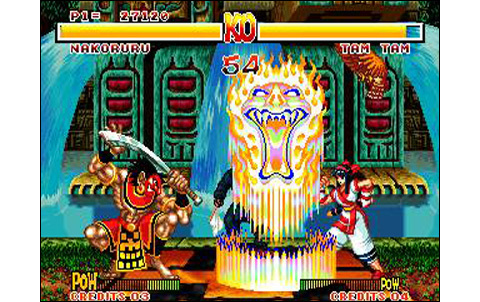 In fact, Samurai Spirits was a real blow back in its time. Providing flawless exciting gameplay, powerful zooms during combats, bloody fights... and packing a wonderful roster of twelve gorgeous characters. How good that is! 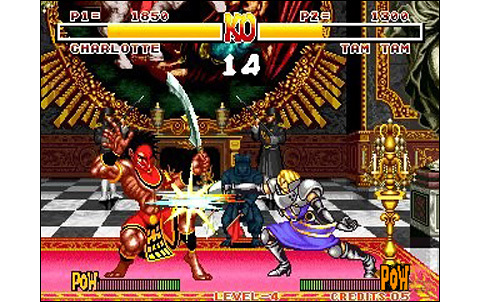 As the game was released, it was a true revelation for many players, and finally a brand new genre from what we knew before in versus fighting. A tremendous master stroke by SNK, signing here a real masterpiece of arcade video games. 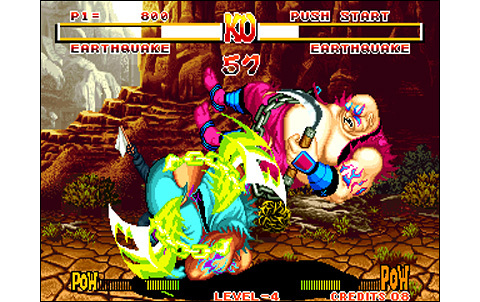 Big and beautiful fighters, sublime and varied backgrounds using the huge palette of the Neo Geo: Simply cream of the crop back in 1993. 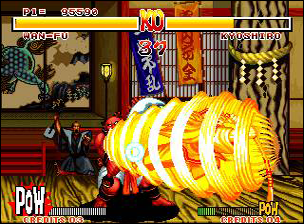 Zooms are pretty well managed, character are fast and their moves nicely decomposed. 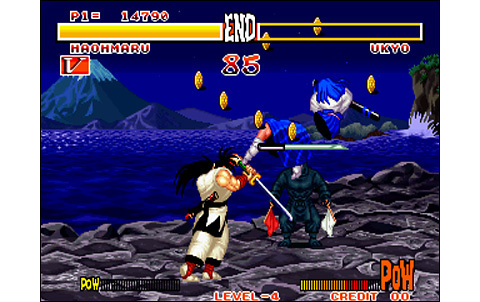 Dynamic and stylish, the themes are catchy and stick perfectly to the fights! Sounds are also perfectly chosen, most will be kept in the following installments. 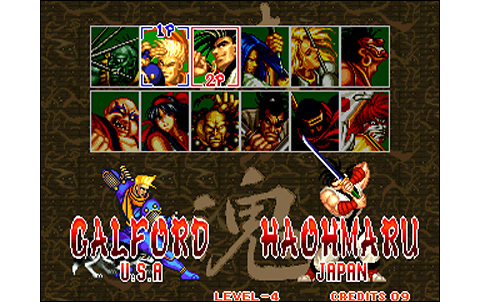 Twelve completely different characters are proposed, while a spiced challenge awaits the single player, and endless duels for two! 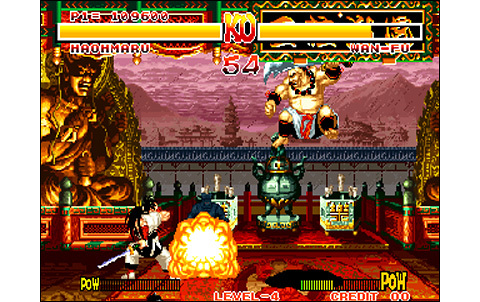 Totally innovative with weapons, Samuraï invents a fabulous new way to play fighting games. 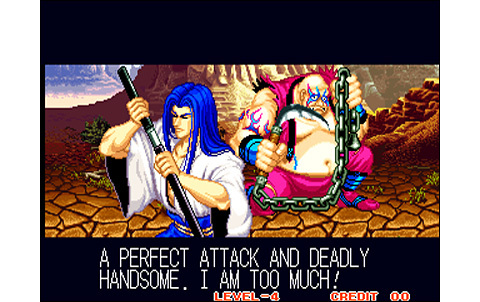 Samurai Spirits is original and beautiful: a major masterpiece from SNK. Simply essential! 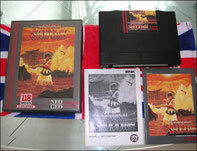 It's less than thirty euros to acquire this wonderful game. It's more affordable than the 1790 francs it was costing when it was released, and that thousands of players have invested so ... Do not hesitate!